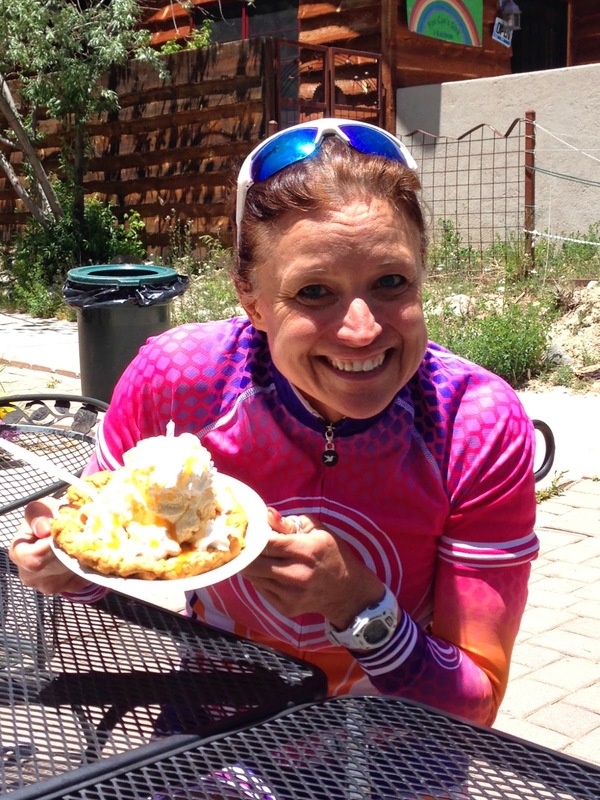 As we researched the Norseman course, Dawn and I quickly noticed that the first 25 miles of the bike is uphill. "Hey, that sounds just like Mt. Lemmon..." and the idea was born. 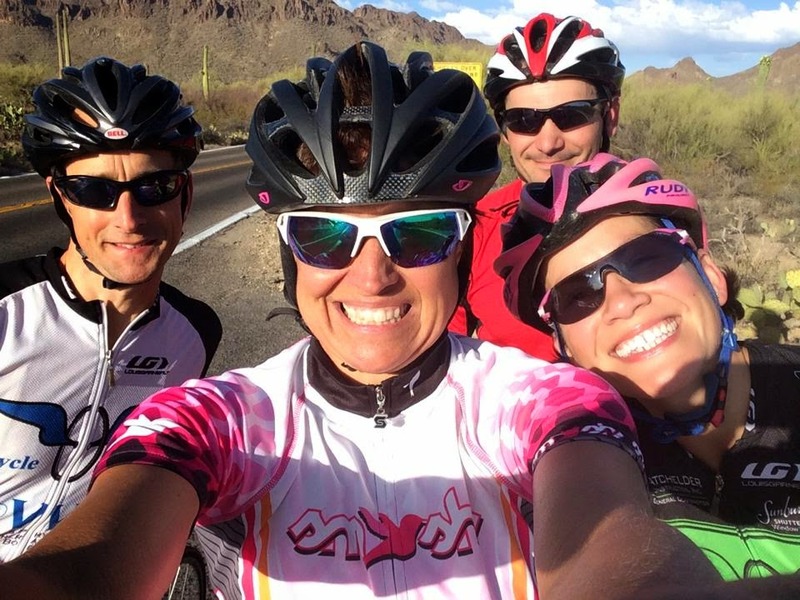 Let's go to Tucson, AZ for some epic training for Norseman! 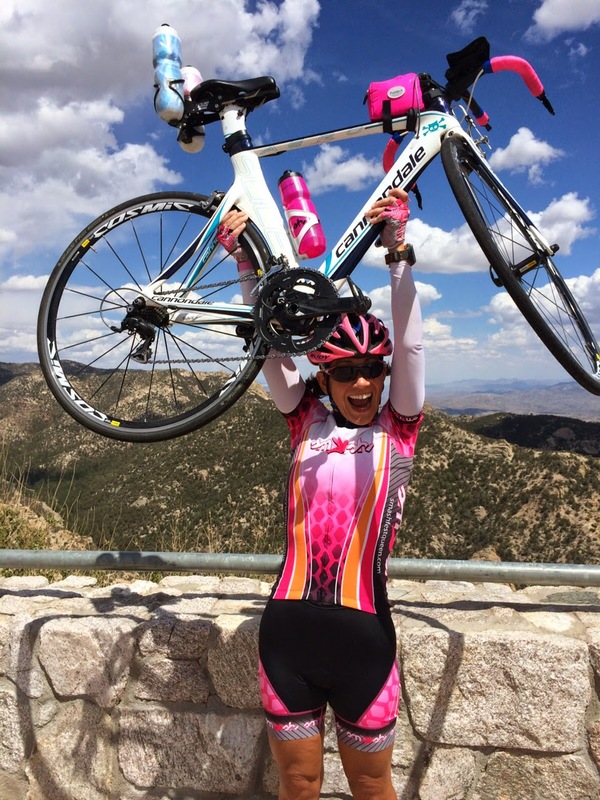 I've been to Tucson twice for grand coachie Hillary Biscay's awesome training camp, and while it's challenging, I loved climbing Mt. Lemmon both times. Starting in the desert among the saguaro cactus, the scenic Catalina Highway winds 25 miles up the mountain through beautiful rock formations and then through pine trees that smell delicious to a cute little town called Summerhaven, where cookies and pizza await you at the Cookie Cabin. I looked forward to two Mt. 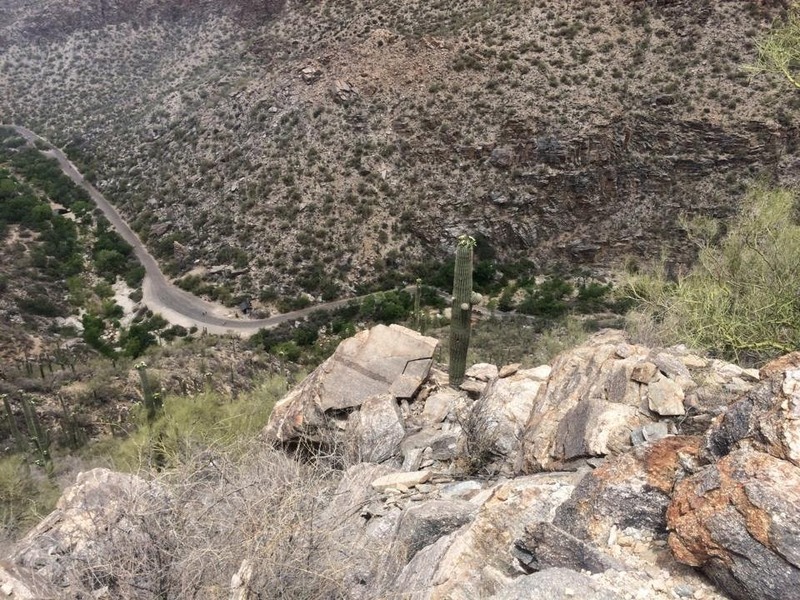 Lemmon climbs on this trip, plus some trail running and some swimming and pro triathlete star spotting at the University of Arizona pool. We left on Thursday for our 4-day training adventure: 2 coaches (Dawn, of course, and Chris Aarhus - her former coach - an extremely knowledgeable guy and a GREAT teacher) and Tri-Belief teammate Trent (who will be crushing dreams at BSLT in a few weeks). I was certainly the weakest link in this group as far as riding and running go - and without the safety net of my girls and Shelly in particular, I was more than a little apprehensive about how the weekend's training would go. Of course it went great. It went better than great. It went so well that I can't even find words to describe it - so I'll just present a photo gallery of some of the fun. 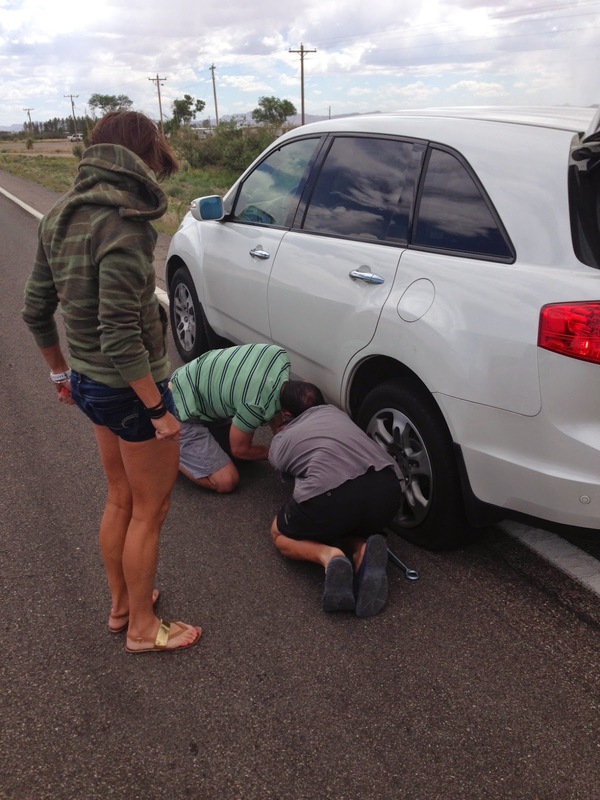 A trip to Arizona with Dawn would not have been complete without some car trouble. Flat tire changed in 21 minutes - of course we timed it. We drove 12 hours to Tucson and then went for a ride that evening. Gates Pass/McCain Loop - omg still my favorite. Day 1 on Mt. 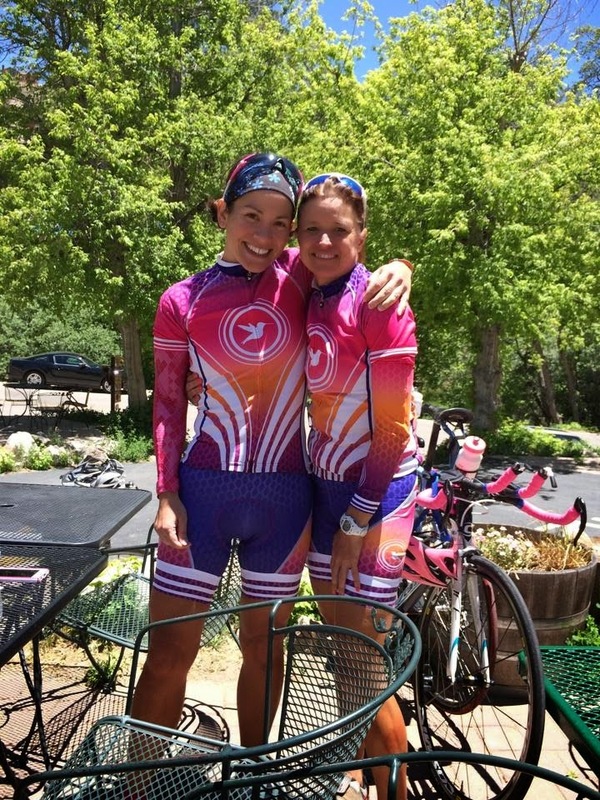 Lemmon - smiley smiley matchy matchy in new Smash Sunrise kit. This guy taught me to ride my bike. I am not even joking. A birthday cookie for Coachie! Day 2, Mt. Lemmon: after a cold, rainy climb, we prepared thoroughly for the descent - plastic gloves held on with electrical tape to keep our hands warm - and plastic garbage bags down our shirts. ...and then the sun immediately came out, so we stopped halfway down to take all that plastic stuff off and took some fun photos. 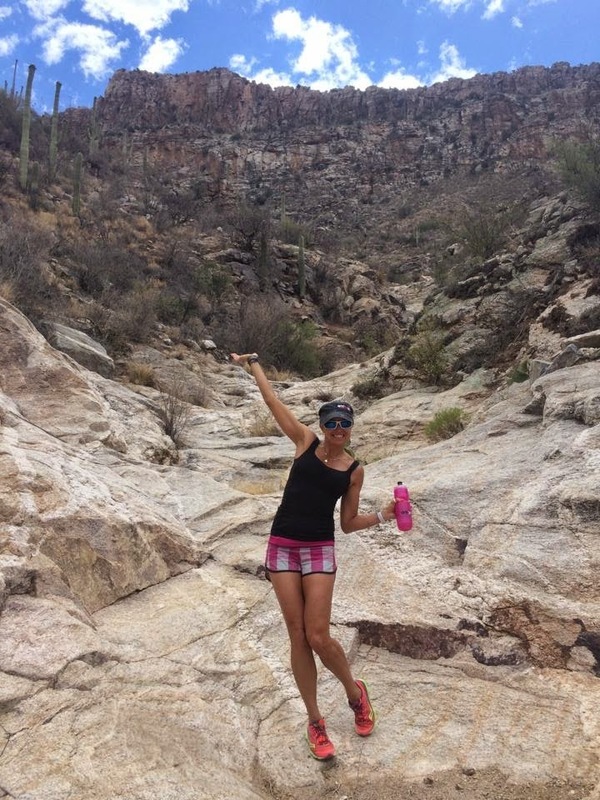 The next day we ran for a couple hours in Sabino Canyon - beautiful. And then Dawn and I looked back and realized we're both afraid of heights. Yes, there was a discussion of "look down there and see how far you've come," and yes, there may have been some tears. I mean, look at this. Gorgeous! I have learned to love trail running. Yep, I just put that in writing. Super fun pool shenanigans. We got to swim here twice. The most beautiful pool I've ever been to! Coachie put the hurt on us in the last workout of the trip - when we were done I couldn't move my legs and could barely drag myself out of the pool. 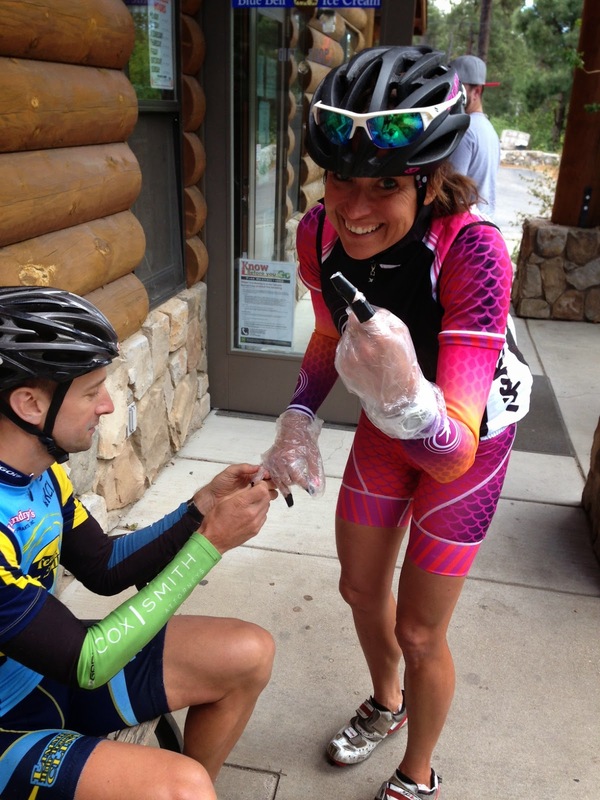 During one of the more challenging times on the mountain, as Dawn and I climbed for hours in cold rain and then screamed with joy in unison as the sun peeked out, Dawn mentioned something that she learned at Ironman Texas last week (while qualifying for Kona, no less). She said it's really important to have happy anchors to turn to during a long race like that (think Happy Gilmore's happy place), and that I needed to start building a library of them - maybe I could start with the feeling I was experiencing at that very moment? Yes! Mt. Lemmon climb - a happy thought to carry with me while racing Norseman (and beyond). And countless others from this trip. 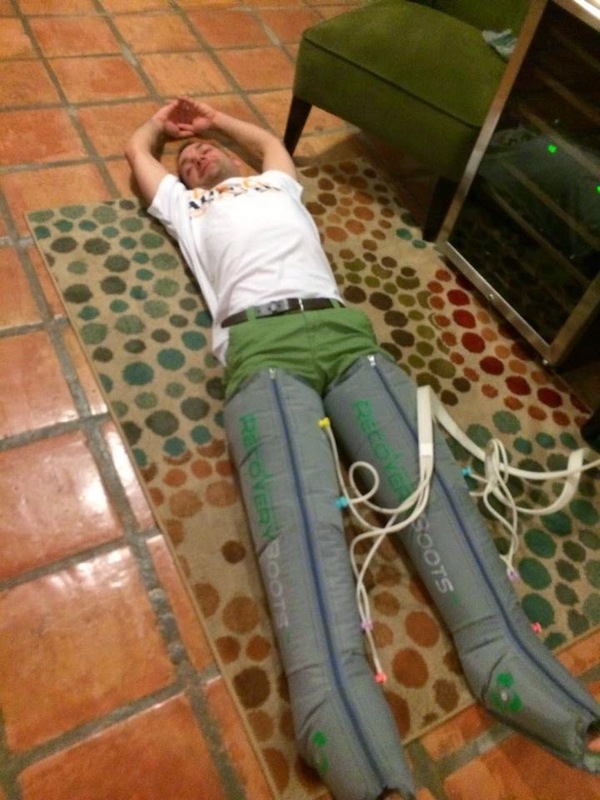 As soon as I returned from New Orleans, training for Norseman (which is now 2.5 months away) began in earnest. This included a hillfest of a 90 mile ride and an equally hilly 15 mile run the weekend after the race (usually the weekend after a race consists of "easily spinning out legs" - no time for such luxuries now!). The ride was a gorgeous tour of the hill country on a beautiful day in which I happily chased my new teammate Trent, who showed no sign of cracking while I tried not to puke for the last 20 miles. After the ride, I immediately drove up to Boerne (without showering, Coachie would be proud) to meet with the family and formalize details about the trip. Dad is the ultimate planner and has figured out the entire vacation, and I am so grateful! Yep, that's a 30 year old map from when we lived in Stavanger. What could have changed? The following day, I ran 15 miles solo, including a 4 mile out-and-back on Kyle Seale, one of the hilliest roads around here. I was happy until I hit mile 12, at which point I blew up and shuffled the last 3 miles back to my car, got in and started crying. Feeling overwhelmed, thinking, oh my God, I'm so tired, this is only week one, Norseman is HARD, what was I thinking, how am I going to do this??? Then you see something like this on Facebook and it makes you smile all day. Of course I'm the luckiest person alive to get to do this! We have a plan that makes sense to me. 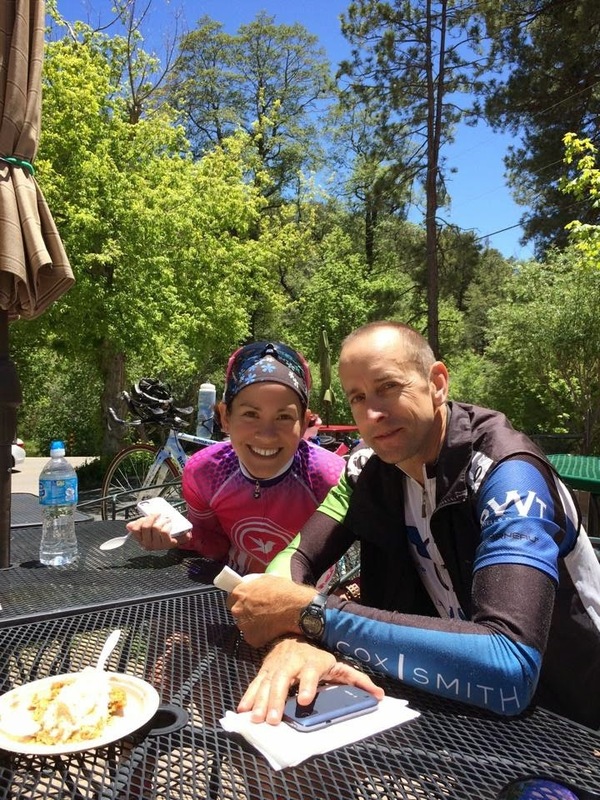 After some research and discussion, Dawn and I have figured out that I need to build mileage like I would training for a regular Ironman, but to include as many hills as I can on both the bike and the run to prepare for the 16,000 ft elevation gain (!!!). Although only the first 160 people to reach the mountain will get to climb it and go for the coveted mountaintop finish and black t-shirt, we're training like I'm going to be one of those people. So in addition to the usual run training, mine has involved trails (which are not as bad as I thought) and, at the suggestion of Ann, a stairclimber (which is worse). With my head back on straight, I'm enjoying the journey and looking forward to this amazing vacation in August. The plane tickets and hotels are booked and I'm officially registered for the race and looking forward to receiving my pack of goodies from blueseventy. This makes it official. O M G.